My colleagues and I have mentioned in our posts that Johns Hopkins Medicine International (JHI) has nearly 20 affiliates from 15 countries—on five continents. We’re very proud of these affiliations with leading hospitals, health providers, governments and educational institutions from around the world. You may be wondering how we arrive at these relationships. Many organizations today build and improve health care facilities around the world, and they’re doing important work. But when Johns Hopkins pioneered the concept of international collaborative health 20 years ago, we knew this work couldn’t be one-sided. It’s important to us to choose global affiliates who will help us create comprehensive programs to improve health and health care, and who will be committed to sustaining that work long after our agreement ends. Leaders across Johns Hopkins institutions expect that we will collaborate only with affiliates that align with our mission and help us deliver the promise of medicine on a global scale. We partner with top health care organizations as they strive to enhance clinical outcomes and patient safety—and we often expand these relationships to include education and research collaborations. We do our homework before every potential agreement. We evaluate geopolitical, economic and safety considerations, as well as the organization’s reputation, clinical environment, quality of care and patient safety, and financial and legal risks. We also assess if Johns Hopkins has the capacity to carry out our side of the collaboration without affecting our local mission. As JHI continues to grow and diversify our projects, we use a customizable framework encompassing consulting and collaborations, affiliations, clinical partnerships, management agreements, and joint ventures to characterize and complete specific projects. So, while we frequently work with hospitals, our current portfolio also includes agreements with a technology company to set up a network of primary care clinics in India, an insurance company in Peru and a university in China. Based on client needs, our contributions and the type of agreement, some projects are short-term (two or three years) and smaller in scope. At the other end of the spectrum are joint ventures where Johns Hopkins has an ownership stake, such as our first-of-its-kind agreement in the Kingdom of Saudi Arabia: Johns Hopkins Aramco Healthcare. Regardless of the type of collaboration, we adapt best practices to meet the cultural needs and expectations of our affiliates. We also work interactively and provide customized solutions. At Johns Hopkins, we established ourselves early in the field of international collaborative health, but we also continue to innovate and explore new opportunities. With any new affiliation, our goal is to help our collaborators achieve their health care mission—and to expand and improve health care worldwide. 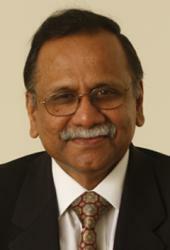 Executive Vice President | President, Global Ventures Dr. Mohan Chellappa leads international clinical consultancy activities at Johns Hopkins Medicine International (JHI), especially in the areas of developing clinical care programs, implementing quality systems and using information technology in health care. As one of JHI’s founders, he has been instrumental in securing and establishing various Johns Hopkins Medicine clinical, management and enterprise developmental initiatives around the world. Click here to learn more about Mohan.